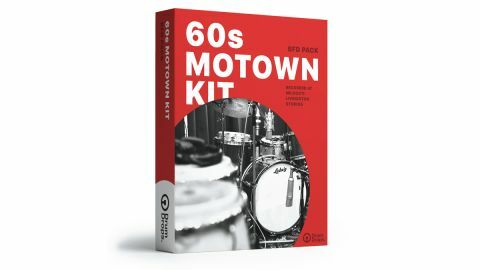 The 60s Motown Kit is excellent at what it does, naturally extending its appeal towards jazz, funk and breakbeats too. At £35, it’s almost impossible to fault. The Motown drum sound from the 60s is instantly recognisable: it’s ambient, yet punchy. It’s also often quite crunchy sounding and, crucially, it’s really quite difficult to replicate with raw samples. We were intrigued, then, when we heard through the grapevine that UK sample/loop producers Drumdrops had recorded a set of multi-layered kit samples, and packaged them up in an easy-to use expansion pack for FXpansion’s BFD, to bring the Motown sound to your computer. You’ll need BFD (versions 2 or 3), although it is also available for Native Instruments Kontakt, as well as straight samples for you to load into your sample player of choice. Let’s start by talking about the gear. You get Ludwig Club Date shells (20", 12", 14"), plus four snares (2 x Ludwig Pioneer, Ludwig Hollywood, Slingerland Shelbyville). Cymbals are courtesy of Zildjian (vintage hats, trans stamp crash/ride and a Constantinople crash/ride). As well as the basic kit, you also get a pair of congas, hand claps and a tambourine. Part of the reason that the Motown sound is so distinctive is down to the production at the time. Bands were big and track counts limited, so in order to sound like Detroit circa 1965 you first need to record like it. The kit has been captured using the same type of room set-up as used on Motown records. That is, a close mic on the kick and a single ‘kit’ mic positioned between the toms. In addition to that (and perhaps most importantly) there are also ambient mics placed where the brass section and vocals would have set up during a vintage session. These are combined into a single ambient channel in BFD to make tweaking easy. Sound-wise, Drumdrops has got it nailed. It’s full, ambient, and has been processed just enough to provide some of that vintage-driven sound, without being overbearingly distorted. The snares are all of a very similar sound - this is a pack with an agenda, after all - but each with a slight twist on the theme. They’re fat, cracking at higher velocities and very funky, while the cymbals are all trash and wash in a really musical way.